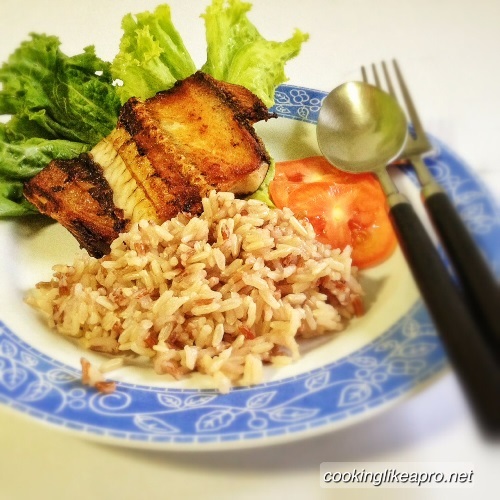 Cooking daing na bangus is a Filipino style recipe. It may be prepared at home - with very little effort or as many would prefer, it may be easily bought from restaurants or kitchenettes, cooked and well-garnished. However, if you like to learn how simple this home cooking recipe is prepared, stick around. 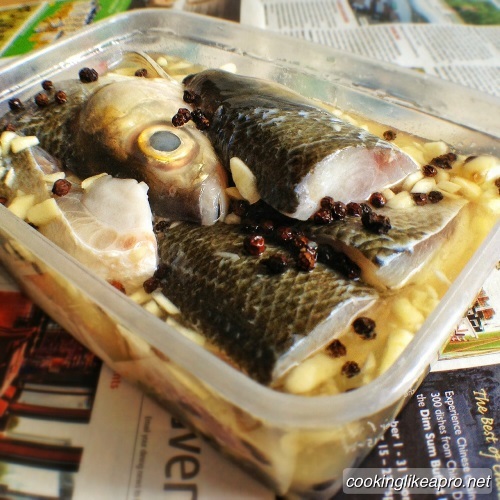 Cooking daing na bangus is a milkfish recipe marinated in fermented vinegar. 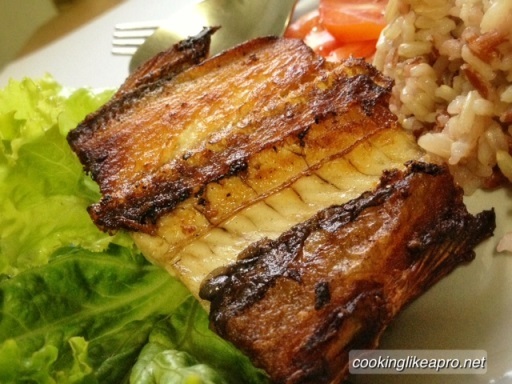 If there's no milkfish in your market, sea bass may be a good alternative for this dish. Preparing this dish takes a bit of an effort. There will be a lot of garlic crushing, which what gives the fish an aromatic taste. You will also need a secured or sealed container to place the marinade. It should be locked tightly to avoid any drips and a smelly fridge. Rub the fish with salt and garlic. Place the fish neatly, one by one, in a deep plastic container with cover. Pour the vinegar and water into the container. Pour peppercorns in the dish. Seal tightly. Use rubber bands and/or put inside a plastic bag if needed to make sure the liquids won't spill. Let the dish marinate for at least 4 hours before cooking. When you buy the bangus or milkfish in the wet market, ask them to cut the fist in 2 (lengthwise); then cut it again across into smaller pieces. This makes it easier to store and to cook. This bangus marinade may last for days, weeks and even a month. However, this dish doesn't usually last that long in the fridge because it's very tasty and quite addictive. When you fry, I suggest to get the fish at the bottom of the container. These are the most-immersed in the vinegar mix. Re-arrange the remaining fish as necessary; and cook them when you please. I suppose there's no more need to buy daing na bangus from Tapa King or Pancake House at this time. 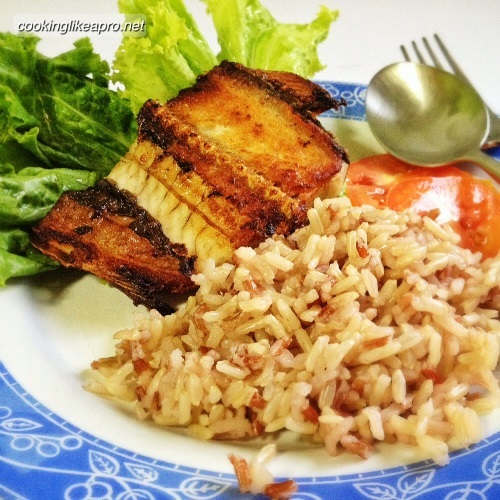 Cooking daing na bangus is simple, easy and may even be more tastier when done at home. Now, wanna' see how I'm cooking lumpiang shanghai? If you're interested in getting the exact measures of the water and vinegar for this recipe, please head on to our Exact Ingredients page. Ginagawa din namin sa galunggong yan! Sarap din. Pero madalas namin idaing e bangus talaga. I love milkfish; in fact, I can survive eating milkfish with rice for a week. When I want daing na bangus, I actually just buy from the supermarket's frozen section. I miss doing it from scratch!